Dalou and Rodin. These were years of success. In 1889, Henry Montandon, a rich engineer, commissioned from him a bookcase today in the Musée d’Orsay. He also made furniture for Jules-Albert Kahn and Coquelin the Elder. Carabin habitually incorporated female figures into his work, their contorted forms fleshly and creatural rather than refined and idyllic. He photographed his models, building up a vast library of poses that must have made its contribution to this clock, to be sold at Drouot by Millon & Associés. 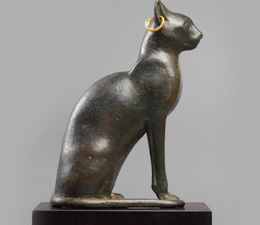 This is a unique piece, commissioned in 1910 and shown at the Salon of 1911 as the property of a M. de Biéville, Henry Montandon’s son-in-law. 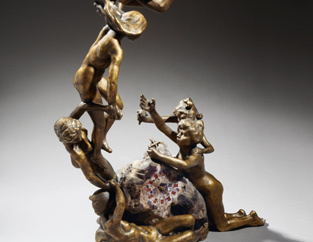 This allegorical timepiece has a chain of four naked female figures leaping into flight, the last, still earthbound, joined to the solid amethyst of the clock; on the right, two kneeling women attempt with desperate gestures to hold them back.